Our Book "A HISTORY OF CONCORD COMMUNITY, CHURCH AND CEMETERY"
I have created this web site for Concord Community, Church, and Cemetery, Anderson Co., Texas. My purpose is to provide as much accurate and researched information as possible. This site includes a complete listing of the burials, through 2005, that have markers, those that family history tells us are buried there, and many unmarked graves. I have tried to establish as many family relationships as possible for genealogy research. There are several talks that have been given at homecomings. 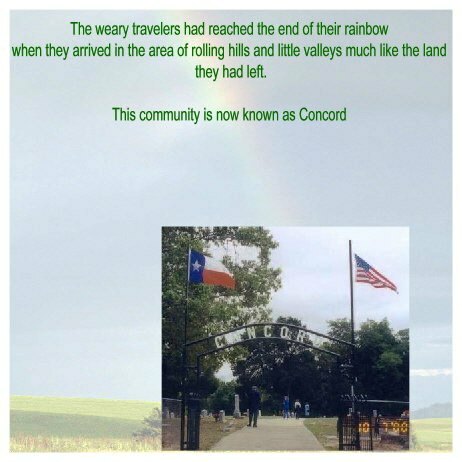 In 1997 when the historical marker was dedicated the book A HISTORY OF CONCORD COMMUNITY, CHURCH AND CEMETERY was published. The book contains documented facts concerning the organization of the church and how the land was acquired for the church and cemetery. The book is online (still in the proofing process). These gates open to the footprints of our past. I am Elda Gatlin Parrish and my roots are planted very deep in the Concord Community. I have been very active with the cemetery association for several years, I currently serve on the Board of Directors. I will attempt to put as much history, programs, and pictures on line as possible. I do hope this site provides a lot of information for researchers. If you have any questions or comments please contact me. This site is under construction! !